Serena Williams of the U.S. celebrates winning a point as she plays Germany's Julia Georges during their third round match of the French Open tennis tournament at the Roland Garros stadium, Saturday, June 2, 2018 in Paris. There was no rust evident. No comeback needed. 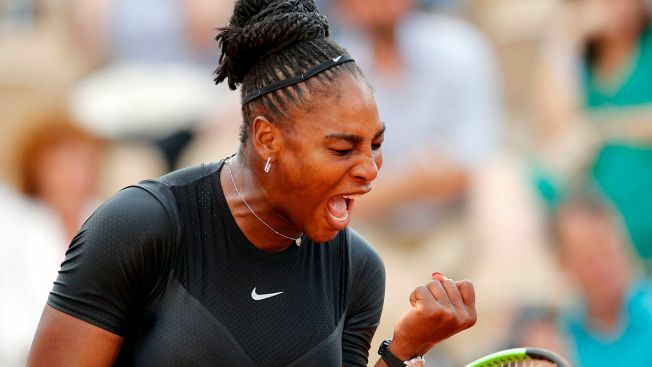 Serena Williams quite simply produced the best performance so far in her return to Grand Slam tennis and easily reached the French Open's fourth round. Williams dominated for stretches against 11th-seeded Julia Goerges of Germany, playing cleanly right from the start of a 6-3, 6-4 tour de force at Court Suzanne Lenglen that lasted a mere 75 minutes Saturday and lacked much in the way of theatrics. Now, then, comes the drama. Waiting for Williams as she competes in a major tournament for the first time in 16 months — and since giving birth in September — will be a familiar foe, Maria Sharapova. The 36-year-old Williams set up that showdown by making only three unforced errors in the opening set against Goerges, 12 in all. She won 12 consecutive points on her serve during one run. The most anticipated matchup for a quarterfinal spot at Roland Garros will pit 23-time major champion Williams against five-time major champion Sharapova on Monday. Sharapova advanced Saturday with a similarly lopsided win hours earlier, beating 2016 U.S. Open runner-up Karolina Pliskova 6-2, 6-1. Williams has won the French Open three times, Sharapova twice. They are the only active women with a career Grand Slam; they are two of only six in history to accomplish that. They are Nos. 1-2 among active women in career clay-court titles: Williams has 13, Sharapova 11. Both have been ranked No. 1. But the head-to-head history is overwhelmingly in Williams' favor: She has won 19 of 21 meetings, including 18 in a row. The last time Sharapova beat Williams was — get this — in 2004. The last time they played was at the 2016 Australian Open. That was Sharapova's final appearance before her 15-month doping ban. "Well, it's been a while," Sharapova said, "and I think a lot has happened in our lives for the both of us, in very different ways." Other women moving into the fourth round included 2016 champion Garbine Muguruza, two-time French Open finalist Simona Halep, two-time major title winner Angelique Kerber and reigning U.S. Open champion Sloane Stephens. Men's winners included 10-time champion Rafael Nadal, No. 3 Marin Cilic, No. 5 Juan Martin del Potro and No. 6 Kevin Anderson. The story of Day 7, as has been the case every day she is on the schedule, was Williams. This is her first Grand Slam tournament since January 2017, when she won the Australian Open while pregnant. The American made a brief foray on the tour earlier this season, but she played only four matches, going 2-2, at two events that are a notch below the majors. She had some problems in her initial two outings in Paris, including in the second round, when she dropped the first set against 17th-seeded Ashleigh Barty before — as Williams herself put it — "Serena came out." After that turnaround, her coach, Patrick Mouratoglou, looked ahead to the third round and predicted confidently: "She'll be ready. She'll be better and better." He could not have been more right. The careless errors were largely absent. The missing energy was back, and how. In front of a crowd that included former heavyweight boxing champion Mike Tyson, it took 15 minutes for Williams to gain the upper hand against Goerges. In the fourth game, as Williams tried to cash in on her fourth break point, Goerges interrupted a baseline rally with a drop shot. Williams not only sprinted to the ball in time, she whipped a cross-court forehand passing winner to go up 3-1, then let out a loud yell and raised her fist. That was part of a surge in which Williams claimed seven points in a row and never really looked back. On set point, Goerges tried a lob and Williams hit an overhead that wasn't quite good enough to end the exchange. So when Goerges got that back and tossed up another lob, Williams punished this one so much, the ball landed in the stands. When Williams was broken for the only time, early in the second set, she immediately broke back. It was almost as if she'd never left the scene. The next test comes against Sharapova. "Any time you play against Serena, you know what you're up against. You know the challenge that is upon you," Sharapova said. "Despite the record that I have against her, I always look forward to coming out on the court and competing against the best players."